It extracts below mentioned (supported) files from the data pack (e.g. dt80_200E_win.cpk), then it extracts corresponding files from Live update file (LIVE00000000) and finally it updates those files extracted from Data pack with changes from Live update (new players, transfers, lineups, basic appearances, boots assignments). What kind of updating logic does it use? [IMPORTANT]When would I want to use this tool? If you need to create updated database files with players which were released via Live updates after latest major Data pack, thus not available in offline modes. It is NOT recommended to apply this tool on any existing community patches, because it is going to mess-up everything - this type of merging is only safe when it is applied to CLEAN, unedited datapack files and without any EDIT00000000. So basically, you'd want to use this tool if you're starting from scratch creating new patchand you simply wish to have as many post-datapack players and formations as possible. This tool cannot edit EDIT00000000. There won't be EDIT00000000 version. Ever. 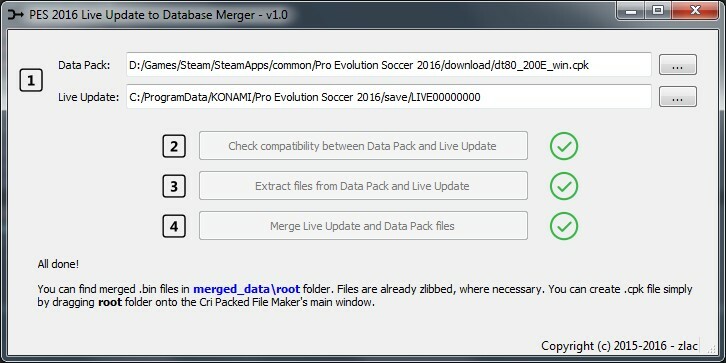 It is not safe to apply every LIVE00000000 to every Data pack - Konami creates Live updates with particular Data pack as the baseline. 3. When Data pack 3 is eventually released, you'll have to use LIVE00000000 files released after DP3 release date, etc. Trying to apply Dp1 compatible Live update to Dp2, or Dp2 compatible Live update to Dp1 would mess-up the database, so the tool does not allow such combinations. Well, it is what it is - starting line-ups taken from Live updates tend to be Belle de Jeur kind of lineups - the ones which were actual during the week when Live update was released. The usual starters may be benched due to injuries, long-time suspensions, etc. Be sure to review the starting lineups and do the necessary corrections at some point. You may end up with more players being deleted from career modes than usual. This can be easily fixed by manually editing merged PlayerDeleteList.bin and removing IDs of the players you want to be available as free agents. As usual, there are no warranties that something won't go terribly wrong - be smart and do your backups before you use this tool.